On Monday’s Mark Levin Show, Brian Mudd from WJNO fills in for Mark. 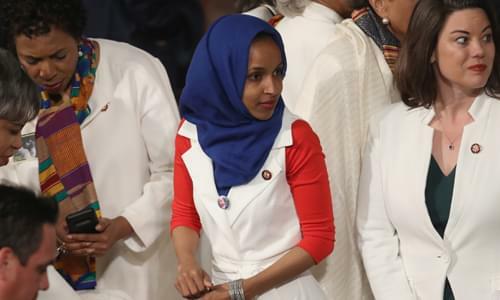 Newly-elected Congresswoman Ilhan Omar has been called out by Democratic leadership for her anti-Semitic comments. They insist that she apologize for her statements regarding Israel and her support of Boycott Divestment Sanctions (BDS) movement, whose mission is to paint Israel as oppressive occupiers and denying the Jewish State’s right to exist in the area they call the West Bank. Other Minnesotan’s making headlines is Amy Klobuchar who announced her candidacy for President amidst a snowy backdrop in Minnesota. The only thought that came to mind was that she didn’t have a snowballs chance in hell of winning, despite being characterized as brave for weathering the snowy weather. Then, illegal immigration continues to be hotly debated and the democrats argument that all we need is technology is a complete fraud. The moment that border apprehensions increase, the truth is that we don’t have the infrastructure to process all these people. Usually more than 30,000 people and averages a cost of $4.5 million per day to house illegal immigrants at the border. Finally, the Hispanic vote is in doubt as it is no longer considered a safe democratic voting bloc. Florida, for example, has for the first time in a very long time a Republican Governor and two Republicans in the U.S Senate, this, at a time when Florida has its highest population of Hispanics ever.